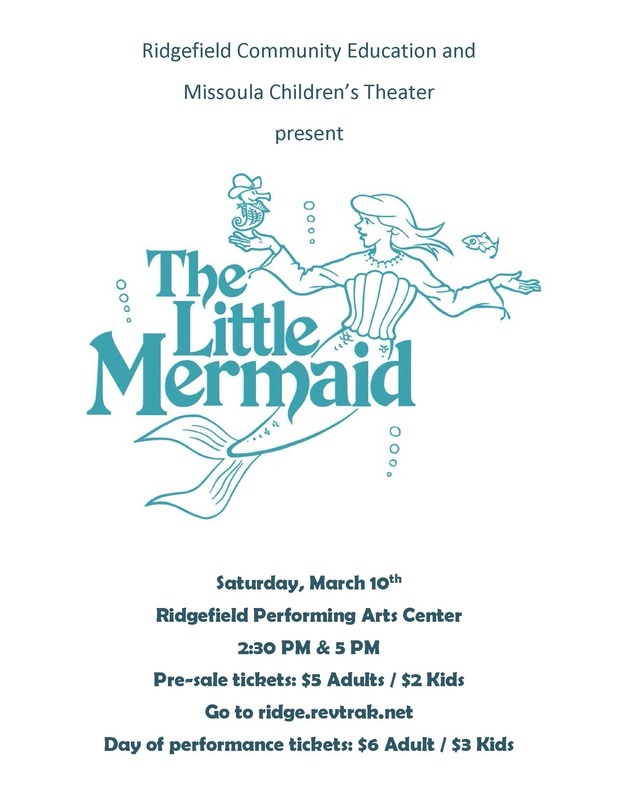 Ridgefield Community Education and Missoula Children’s Theater present “The Little Mermaid” on Saturday, March 10th at the Ridgefield High School Performing Arts Center. Shows are at 2:30 pm and 5:00 pm. Come and enjoy the performances of our talented Ridgefield students as they bring to life this popular children’s fairy tale by Hans Christian Andersen. Advance tickets are now available at ridge.revtrak.net or at the door on the day of the performance. Pre-sale tickets are $5 Adults/$2 Kids. At the door on the day of performance: $6 Adults/$3 Kids. A presentation of Ridgefield Youth Arts Month.